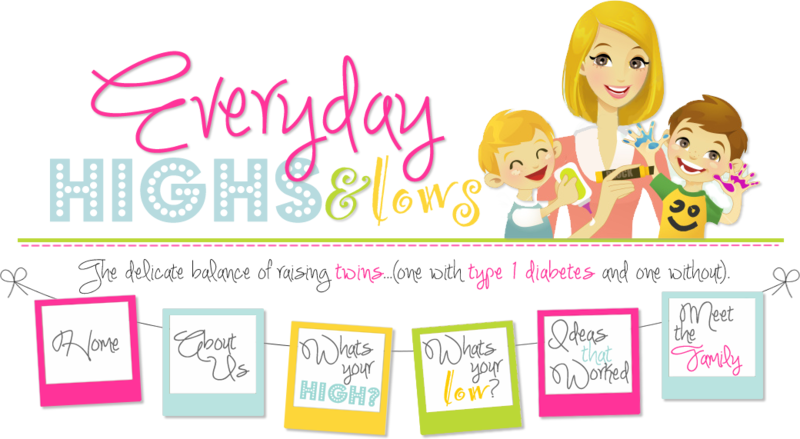 Everyday Highs and Lows: Whats your high? This is the spot where you can be excited about your life and parents who are going through the exact same thing (possibly at the same moment) can share in your delight! For example: if you FINALLY got your son to use a different finger to test on, post it here!They are creatures of habit, aren't they? Or if you finally got your teacher to see the light, tell us. This is the place to put it all out there. Leave your facebook page for banana bread recipes. So, post! Had an AWESOME morning with my diabetes friends this morning at Big boy! So much support! Really inspired me to keep writing and reaching out to those who don't yet have access to such a great group of support friends! We have been trying Apidra as our new insulin and Rocco's blood sugar has only been in range at least 90% of the week!!! Ask your doc about it. It might work for you too! Just sent Rocco to a birthday party flying solo. No hovering mommy, no twin brother. Just him and a cell phone. Good news: we/HE pulled it off! Growth is scary but necessary. well, it's only small- BUT i finally got my 4yo twin son eating the right amount 4 breakfast- he almost ALWAYS! sneaks extra foods in & he has done so well today and been so good about it all- so GO SAMUEL!!! That is awesome Kristy! It is not small at all! Sometimes what is small to the outside world is huge to the inside world! I am so happy for you and your son! Our high is that our insulin pump will be here on Monday - we are excited for our next chapter in our diabetes management - I haven't seen my daughter Allison this excited since she was diagnosed in May of last year! That us awesome!!! We got our pump about three years ago. I could never live without it. It makes diabetes management so much easier to live with! I am so excited for you and Allison! Feel free to send me an email if u have any mommy type questions along the way. Thanks for sharing! This Valentine's Day party was the best yet thanks to some amazing fellow moms! Found this very short and sweet video series: http://blog.healthnutsmedia.com/watch-understanding-diabetes/ There are these small, approx 4 minute videos that explain diabetes. You can watch the 1st one, and then to watch the others they require your name and e-mail. My kids have watched these 3 times already! They are great! I finally put my own inset in by myself. I finally put my inset in by myself. Omg!! That is do wonderful! I remember trying to give myself my first shot during my first IVF cycle. Every time I put the needle up to my skin I would put it in just far enough to feel the first sting then I would take it out. It took me like two hours to get up enough nerve to do it! We are all proud of you! Don't forget to use the numbing cream called EMLA! The other day was Rocco's "day to shine" at school. On the day, each child draws a picture of you and writes a couple of sentences about you. Then the teacher puts it all in a book that you get to take home. It is very sweet. My "high" was that only his best friend in class (who has been very supportive about his diabetes) wrote about it. All the other kids wrote that he was sweet, kind and four girl wrote that he was cute! I am always happy to see that children with health issues can be helped (physically of mentally) by people (health care professionals or other people) to help make their lives as normal as possible. I can only imagine how difficult it must be to live with any illness and children always deserve the best in life. Our high is that my 11-year-old can now do her own pump site changes! I usually do them for her to make her life easier, but knowing that she can do it when I'm not around is so reassuring!!! Kami! You made me cry! Thanks for sharing! Donna, thanks for being so supportive to our family! You have helped us so many times over the years! We appreciate you! Chelsey, thanks for letting all of us rely on you while we actually take a break from it all! You will be a fantastic mother! Wow! That is amazing! Way to go cutie! Be proud mama of your daughter and yourself! Awwww, thanks! Now YOU are MY high! Couch cushions on the floor. Watching my son bounce around and burn off sugar. Perfect activity on a boring rainy day! We all have to blow off steam somehow! Somedays, I think I need to pull of the couch cushions and bounce around a bit! Today's high was seeing my 16 month old's daycare teachers coming together, so eager to learn about giving Jameson the proper care. He was diagnosed 6 days ago and their sincerity and desire to get it all right puts my mind at ease....as much as can be expected right now!